Pretty crowded at the start and in danger of getting pushed over the line but made a reasonable job of it. Beat up the Solent and came across the cable laying barge which had a long line of buoys trailed out the back that we had to go round, pretty light wind and it caught out a few boats who struggled to get round. A thunder storm rolled through as we approached Hurst and the wind picked up in the Needles channel so we put a reef in with others changing headsails. Still beating as we approached Anvil Point so decided to head offshore to avoid the worst of the tide but unfortunately the wind shifted and those who stayed in shore made St Albans in one tack. 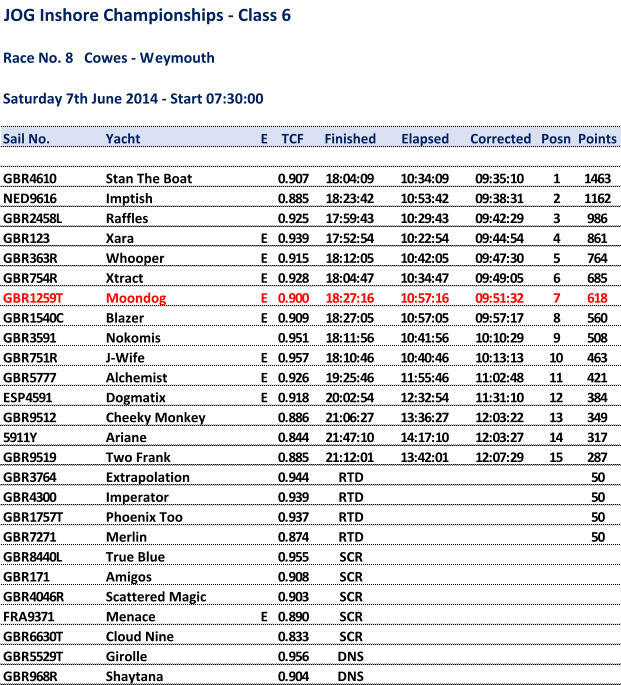 Got the asymmetric up across Weymouth Bay and had a dice with Blazer who beat us into the finish by just 11 seconds.